The developer who once proposed a “really beautiful, world-class” golf course on Plum Island, off the tip of Suffolk County, happens to have been elected President of the United States. Now, some environmentalists and East End public officials are expressing concern about whether they’ll be able to stop the sale of the longtime federal research facility under a President Donald Trump. 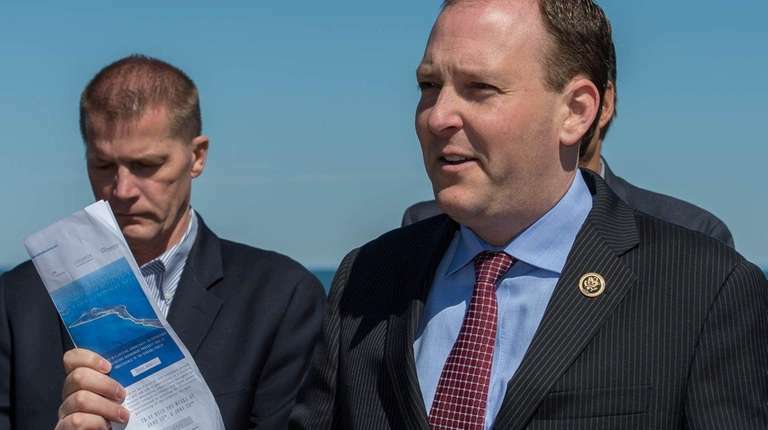 Rep. Lee Zeldin (R-Shirley) said it’s still full steam ahead on efforts to block the sale of the 840-acre island and preserve most of it. “The presidential election does not change that,” said Jennifer DiSiena, Zeldin’s spokeswoman. Trump in 2013 held a series of meetings with environmentalists and local officials, and declared his interest in constructing a golf course with a helipad and a “modest” clubhouse on the island, which is home to the soon-to-be-closed U.S. animal disease testing laboratory. “It would be a low-key and beautiful use for the area,” Trump told Newsday at the time. A portion of Plum Island has been home to the federal government’s high security livestock disease testing lab since 1954. The rest of the island remains a remarkably untouched natural landscape. It’s a landing spot for migrating birds and seals, and has a historic lighthouse and structures from its days as a U.S. Army fort. Preservation advocates including local elected officials are pushing for most of the island to be left as a park or preserve, with some public access. Officials hope a new tenant would come in to use research space on the island, where as many as 400 people are employed. Federal law requires the government to sell the island to help defray the cost of a new animal disease lab being built in Kansas, which is set to open in 2020. It’s unclear if Trump’s companies are still pursuing development of the land. Michael Cohen, an executive vice president of the Trump Organization, referred questions to Lawrence Glick, executive vice president of strategic development for the company, who didn’t return calls for comment. The federal General Services Administration has yet to finalize terms, conditions and methods of sale, spokesman Patrick Sclafani said. But he said he’s “hopeful” that Trump will listen to Zeldin and other local elected officials, who want to prevent development of the island. DiSiena said Zeldin still hopes that the U.S. Senate will pass one of two House-approved bills to require a study before a sale can occur, or prohibit the use of appropriations in 2017 to promote a sale. “Once we see whether the Senate acts on this legislation before the end of the year, Congressman Zeldin will approach the new administration to discuss the path forward from here and get their feedback,” DiSiena said. Sen. Chuck Schumer’s office declined to comment about whether the Senate would vote on Zeldin’s House bills this year. Schumer (D-N.Y.) and other senators have a bill that would eliminate the federal requirement to sell the island to the highest bidder. John Turner, spokesman for the Preserve Plum Island Coalition, a nonprofit that includes environmental and conservation groups, said he hadn’t heard of interest from Trump companies since he met with representatives in 2013. Turner said he hopes the new administration will go along with preserving the island. In an effort to block development, Southold Town passed zoning restrictions in August 2013. Supervisor Scott Russell didn’t respond to requests for comment. Environmental groups have also sued to block the sale of the island.